We first announced our new Discover section at F8 to increase the opportunity for people to find the amazing experiences developers have built for people and businesses to interact with on Messenger. Since that announcement, we’ve been working to make it more intuitive and relevant for you. Today we’re excited to announce v1.1 of Discover which enables people to browse and find bots and businesses in Messenger, starting to roll out today for people in the U.S.
Here’s how Discover works – when you tap on the Discover icon on the lower right hand corner of the Messenger Home screen, you can browse by category, recently visited businesses and featured experiences. Discover makes it even easier to get things done, from reading the latest articles, booking your next vacation, or getting the latest sport highlights, right in Messenger. In addition to this full roll out to U.S. consumers, we’ve also updated the units that appear in Discover, showcasing the many resources you have to interact with businesses, get your questions answered and find the information you want. Recently Used: Shows you the bots and businesses you recently interacted with. Featured: A representation of the full range of experiences available in Messenger. Helps people find bots and businesses to explore. Categories: Bots and businesses organized by topic. Refreshed frequently so you can find new experiences. 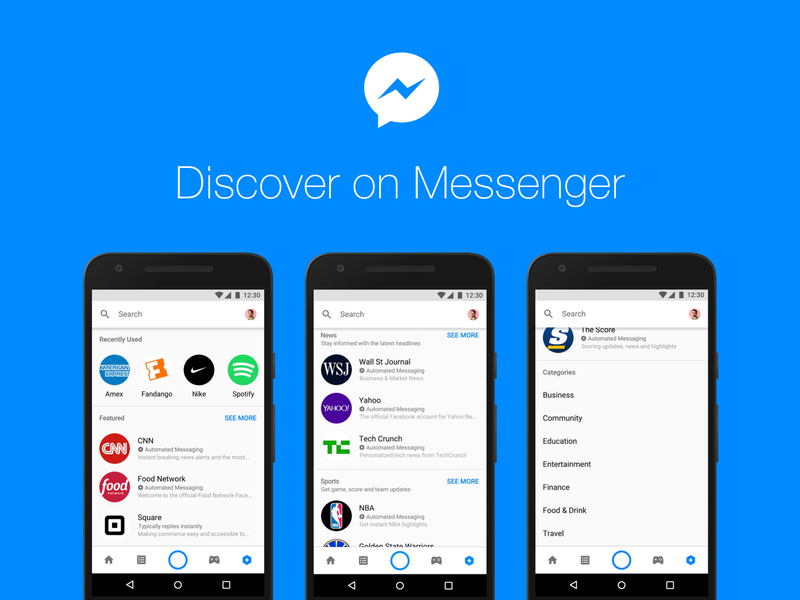 Our goal with Discover is to ensure that experiences in Messenger are compelling, high quality and easy to find. This latest update makes it even more intuitive for people to find what they care about most. And be sure to keep coming back – new experiences are always added! For developers and businesses interested in getting their experiences added to the Discover section, please go here.